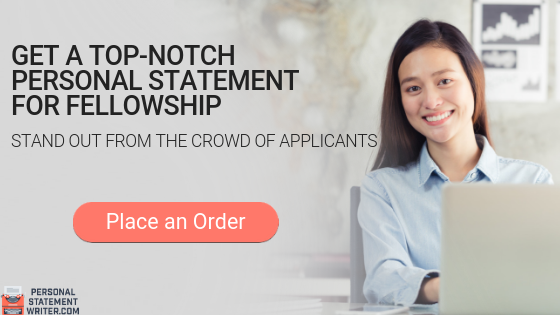 Your application for fellowship or residency is usually made through ERAS and you will have to provide a personal statement for fellowship as part of that application. It is important to know everything from hooking in your reader through to how to end a personal statement if you are to make it effective. The personal statement can be the most important part of your application in many ways. Often the committee is going to more interested in how you are going to work within their program rather than looking at your academic record. After all, you will have had to achieve highly to get this far in your career already. Often you will have very similar qualifications to others that are applying to your personal statement is often the only means they have to tell you apart. Writing a fellowship personal statement, however, is not a simple matter, Many applicants are going to struggle with creating something that is going to make them stand out from the others that are applying. This is why you will want to make use of the help and advice that our professional services offer you. If you look at the personal statement for fellowship examples you will see just how well they are written and the high standard that you will need to achieve. This is not something that you are going to achieve by quickly rattling off the first thing that comes to mind when you are asked to write your statement. You need to carefully plan and consider what is required within your statement before you even put your fingers on the keyboard. Begin as soon as possible: it is surprising how much work goes into writing the best fellowship personal statement. So the sooner you start the better rather than turning everything into a last minute panic. Research your fellowship: every program that you apply to will have very precise requirements and expectations from their fellows. It is important that you discover exactly what these are so that you will be able to reflect them clearly within your statement. Who will be reading your statement: consider who the members of the admissions committee will be and what they will be looking to see within your statement and the style of writing that they will expect to see. Know your passions: you do not want to show a passing interest in your specialty, you need to understand why getting this fellowship really means everything to you and your future career. Understanding and showing your motivations is one of the keys to writing well. What can you contribute to their program: it is not enough to list out how wonderful you are and what you are seeking for the future. Think about what contribution you can make to the fellowship that you are applying to. How Will Your Personal Statement for Fellowship Differ From What You Wrote for Your Residency? Applying to an ACGME accredited fellowship may feel similar to what you did when you applied for your residency but the expectations are going to be very different. As a residency graduate, the worst thing that you can do is to simply use the same personal statement even if you do modify it a little. You are now at a point in your career where you should have a very clear understanding of where your future lays. At the start of your residency you may have had some idea of what you wanted but it only during this training that you would have either confirmed those ideas or developed new interests. So while your residency personal statement may have been quite broad in your approach to your specialty area your fellowship one must be highly focused. You must demonstrate a very clear understanding of your field and your personal goals and ambitions within it. It must be very clear precisely what you are hoping to achieve through your fellowship and how you will do so. While your medical college will be uploading your documents through the EFDO you will need to create and upload your personal statement through ERAS. You can create as many as you want which gives you the opportunity to carefully tailor your statement to the programs that you really want to get accepted to. The better that you reflect what they want the more likely they are to bring you in for an interview. Prepare carefully before you start so that you fully understand what needs to be included within your statement before you begin. Tell a story: while your writing needs to concise and to the point and relevant to your application you do not want it to read like your CV. Avoid using clichéd or blatantly obvious statements within your writing. Ensure that every sentence is unique to you and that it adds true value to your application. Don’t make any claims that you cannot back up with an example. Always substantiate what you say rather than simply saying that you are good at something. Review your writing: your first draft is unlikely to be your best writing, it will also certainly be too long. Be prepared to spend considerable time trimming and refining your writing. Proofread: even the simplest of mistakes will be enough to lose you the opportunity for an interview. Always carefully check your work prior to submitting. How Can We Help You to Submit the Best Fellowship Personal Statement? Whether you are looking for a family nurse practitioner personal statement sample or need help with applying to your fellowship our experts are here to offer you the help that you need. 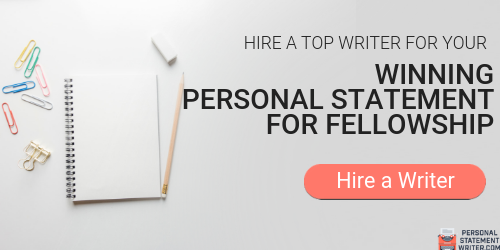 We know just what the programs are looking for and our staff are highly experienced at writing successful personal statements that you can be proud of. Make your order: simply complete the form that you will find on our website which you can access from anywhere at any time. The information that you provide is treated with full confidentiality at all times. Pay for your service: we provide our professional help at one of the lowest prices that you will find online. Your payment is made through secure methods for your protection and is made using either credit card or PayPal. Work with the writer: your writer will contact you directly to confirm that your order is accepted and to start to discuss what is required for your personal statement. All writing is done using your information and from scratch. Request any changes: we want you to be proud of your statement and will make unlimited changes to the draft that is created until you are fully satisfied with the end results. Receive your finished fellowship personal statement: once changes are completed your statement is checked by our proofreaders and a plagiarism report generated. It is then delivered to you on time in the format that is right for you. Make your personal statement for fellowship application stand out and give you the best chance of an interview by working with our reliable professionals!